Between fear-mongering documentaries and an ever-increasing number of people convinced they're allergic to gluten, it's tough out there in the burger game, but that hasn't stopped many a burger brand from taking hold of America's hearts, minds, and wallets... mostly hearts, though. But which of America's biggest burger chains are most beloved? And what parts of America love them? To answer these questions, we crawled over 20,000,000 Foursquare check-ins to see how many people eat what type of burger and where. Then we calculated what brands over-indexed the highest in every county. Then we got really hungry and ate burgers until we passed out. Then we woke up and made this map, which you can look at in even greater detail via this enlarged version. 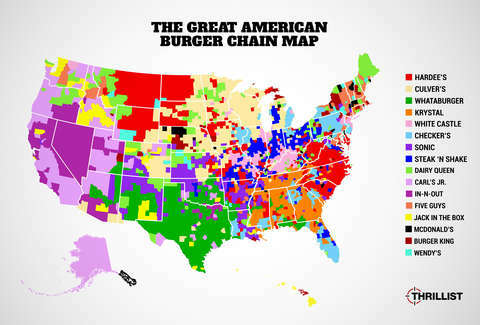 Keep reading (and picture-looking) for a detailed breakdown of each chain's imprint on this burger-loving country. The king doesn't necessarily seem to reign (get it?!) in any one particular geographic area (though upstate NY seems to love a good Whopper). As you'll see with McDonald's and Wendy's, this particular approach is probably friendlier to regional chains with rabid followings as opposed to the biggest national powerhouses. Maybe its breakfast policy will change things? An impressive showing from CJ out West, particularly in the less-populated areas of California and almost all of Alaska, where they demand their bacon ranch fries. Checkers' presence is rather... checkered (boom!) across the Eastern portion of the United States, though it's pretty steady along the Gulf Coast. It was kind of Wisconsin to share the ButterBurger with the rest of the country (or a good portion of it at least). While the rest of the country may love it, though, Wisconsin REALLY loves it. Tough to discern a real pattern in Dairy Queen's nationwide presence, although it seems to primarily be clustered away from major cities. Blizzard appreciation crosses all cultures. One of the fastest-growing burger presences in the country, Five Guys has expanded past its DC-area roots (where it still projects considerable influence), to become a dominant meat force along the Eastern Seaboard and in several large swaths of the Northwest. If you combine the imprint of fraternal burger twins Hardee's and Carl's Jr. (one of the most confusing arrangements in all of fast food), you get a pretty impressive national reach. Must be the creative advertising. Powerful in Cali and completely dominant in Nevada, In-N-Out has even made inroads among notoriously Whataburger-loyal Texas. Also, it seems some people in Oregon don't mind a road trip South for a Double Double Animal Style. Largely a West of the Mississippi phenomenon (though almost shut out in California, where it all began), Jack in the Box shows up strongest in the Northwest. Then there's that little pocket of North Carolinians who must've been excited about the Hella Peño Burger. The strongest overall presence in the Southeast, especially in its birthplace (Tennessee) and current home base (Georgia). Unsurprisingly, your likelihood of meeting a girl named Krystal also increases in these states. At first it might seem odd that the Golden Arches would be so sparsely represented, but it makes sense when you think about it -- Ronald and company are so universal at this point that you don't necessarily shout your plans to go scarf down a Big Mac to the rooftops. Unless you're in NW Nebraska, apparently. Expected a bit stronger showing in its home base of Oklahoma, but Whataburger's presence is also quite robust in the Sooner State. If there was a way to measure the number of people angry that Sonic keeps running commercials where they live despite the frustrating lack of a Sonic, they'd dominate. They would also dominate in cases of post-traumatic shake syndrome. Which Fast-Food Cheeseburger Is the Healthiest? The late Roger Ebert would be thrilled to see the beloved burger chain of his youth reigning supreme in central Illinois (its birthplace). It also gets plenty of love in Indiana (where it is headquartered today) and throughout the rest of Big 10 country, with isolated areas of Frisco Melt lovers popping up throughout the Southeast. Shockingly little love for Wendy in her native state of Ohio, but there are pockets throughout the country that love to get their Baconator on. It's no surprise that Whataburger reigns supreme in Texas, dominating most of the state, with scattered areas of influence across the rest of the Southern half of the country (and a particularly dominating presence in the Florida Panhandle). Also, it seems some folks in the SE corner of Utah are engaged in some Whataburger-related border jumping. Harold and Kumar would undoubtedly be happy to see White Castle's strong showing in New Jersey. Also, until the Colonel decides to get into the burger game, they're looking rather formidable in Kentucky, as well as the Chicago and St. Louis areas. Cody Kestigian is director of strategic analytics at Thrillist. He's looking for a quiet place to settle down in Dairy Queen County. Follow him at @Cody2k. Matt Lynch is a senior editor at Thrillist. Follow his rising cholesterol at @MLynchChi.